Custom Built. User Friendly. Cutting Edge. Our Learning Management Software (LMS) is unlike anything else in use. Entirely custom built, most of our courses are viewed through our cutting edge platform, and not a third-party LMS designed for an alternate function. Above is a screen shot to outline some of the key features from our state of the art software you will experience. My AtLeisure: At any time, simply clicking on "My AtLeisure" button will bring you to your default home screen. Log Out: Your course progress is auto-saved on our server, not your computer. So log in to our site from anywhere, at anytime, and pick up where you left off. Automatically! Customer Support: We pride ourselves on our customer support. Past customers have gone out of their way to commend us for our customer service. Inspired by Apple, we don't make you call and push a bunch of buttons to reach the correct department. A person will answer your phone call and in most cases, that is the same person who will help you with your inquiry, so you're not being transferred a bunch of times. If you contact us via our Support Form outside of regular business hours, this is monitored by all employees of At-Leisure and depending on the nature of your inquiry, will yield you a timely response. Optional Audio Narration: Most of our courses offer optional audio narration. Readings are performed by a professional reader in a studio, not a computer program or person in an "echoey" room. If you prefer the course without audio narration, simply mute the volume; course progress is not affected by audio narration. You may also have the option to amplify the audio via AirPlay! Course Progress Bar: Never guess on time. The Course Progress Bar allows you to monitor your progress and even skip back to an existing slide for reference. View Options: Option to increase or decrease the size of the text, also the option to expand the LMS to view in full screen. Slide Advance: Clicking the arrows allow you to advance slides, and monitor how many slides are left in a particular module. 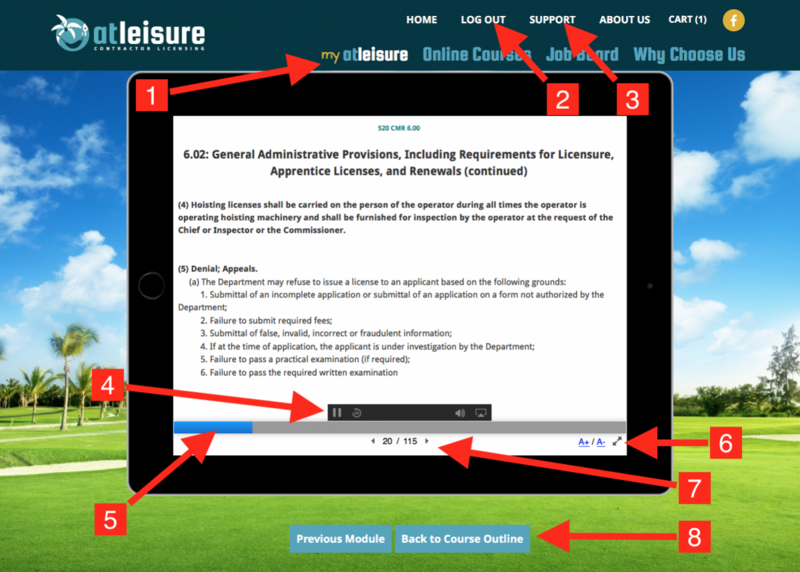 Module Progression: Allows you to easily advance modules, or quickly view the entire course outline to pick your module.